Inside Scoop: Learn how to spot the worst and buy the best gluten-free foods for a happy and healthy gut. If you’ve been diagnosed with Celiac, gluten-sensitivities, or if you know that gluten makes you feel lethargic and foggy, you may have looked into a gluten-free way of living to improve your symptoms and your overall health. That’s awesome, and guess what? 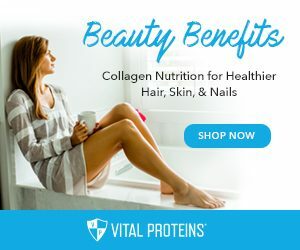 There are SO many amazing, and totally the best gluten-free foods that you can buy, so living gluten-free doesn’t have to be as hard as it once was. But with an increase in popularity comes an influx of gluten-free products, and not everything out there is better for you, or your system, just because it’s been labelled as ‘gluten-free’. Trying to recreate a texture or flavour and trying to make a product appetizing often means that a food needs to undergo some form of processing. 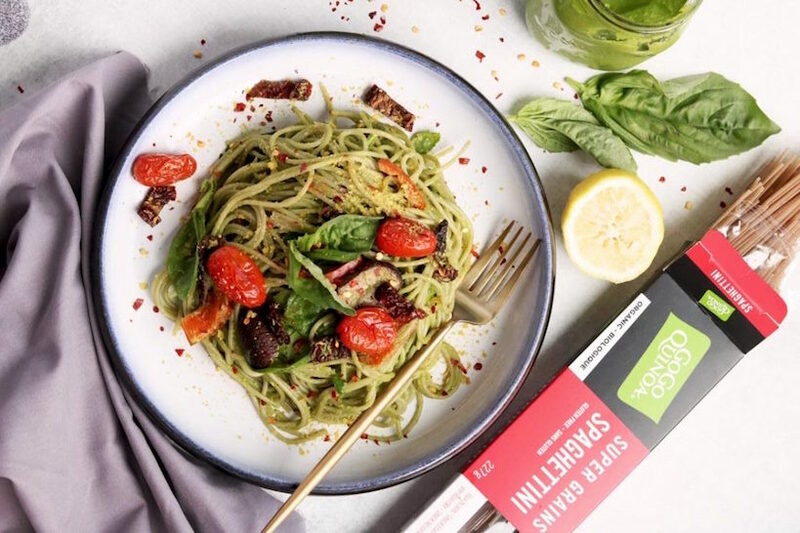 While there are great companies, like GoGo Quinoa who put an emphasis on whole food based, high quality ingredients, there are also companies that take advantage of marketing and the innate desire for sugary tasting treats. And, because of this there are a lot of gluten-free products out there than can actually be doing your gut just as much damage as the gluten you chose to cut out. 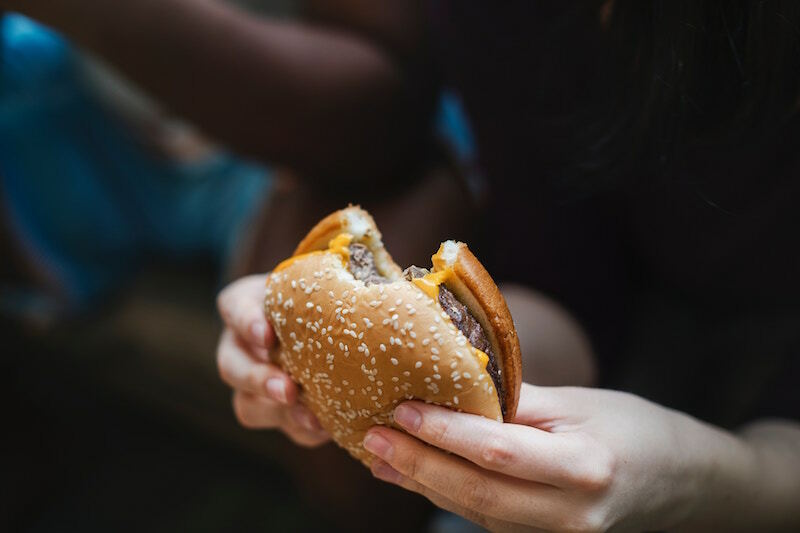 One of the most common things that we see when our clients make the shift from the Standard American Diet or what we know as the SAD diet to a gluten-free diet, is the shift to even more highly processed gluten-free products. No new healthy habits, just changing one aspect of their diet and they’re often curious why they still don’t feel good. Okay, maybe there is a little less bloat, but all in all a highly processed gluten-free diet can be just as damaging to your health as a highly processed gluten-containing diet. If you were to pick up a conventional box of cookies and compare it to certain conventional highly processed gluten-free boxed cookies, you would see a lot of similarities. 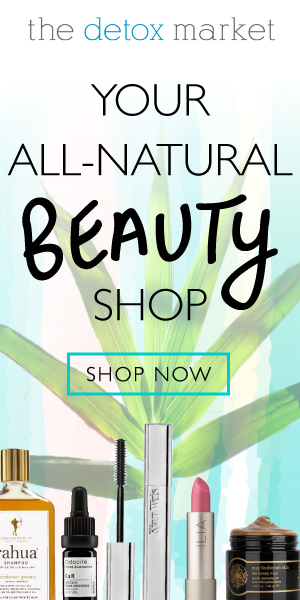 You would see ‘sugar’ or ‘high fructose corn syrup’ as one of the first ingredients, highly refined flours, hydrogenated oils and maybe shelf stabilizers or artificial colours and preservatives. The only difference between the two are the gluten vs. non-gluten factor. You’ll notice that they are still high in sugar, high in artificial ingredients, high in poor quality oils, and quite void of nutrients. When your diet consists of plenty of these highly processed foods, whether they are gluten containing or gluten-free, you put your digestive system, gut microbiome, detox pathways and your overall health at risk. Researchers are beginning to study how taking a whole food and creating an ultra-processed food can have negative implications on the gut, thus creating inflammation and a habitat for disease to thrive. GoGo Quinoa’s pasta noodles, cookies, and super grain breakfast are staples in our households and we feel very confident in feeding our families these products. 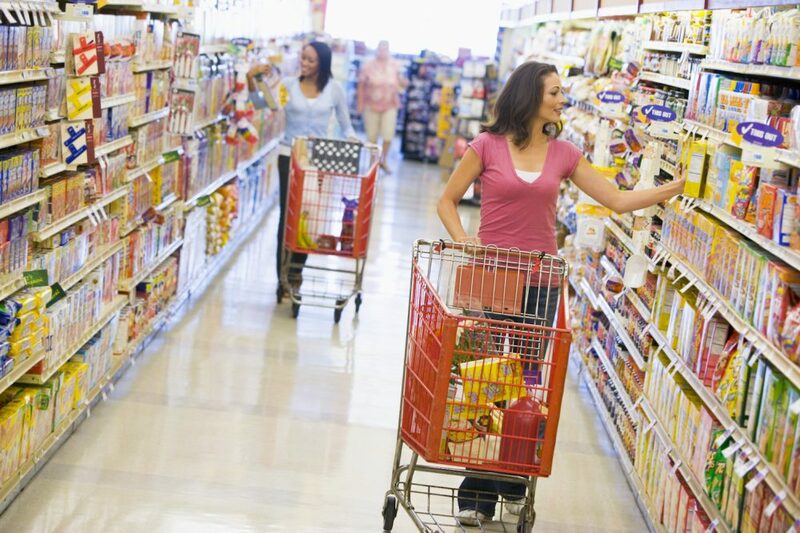 We regularly buy Bob’s Red Mill gluten-free cereals, flours and pancake mixes. And we can’t live without some grain free snacks including chocolate! Many healthy foods need to undergo some form of processing to be fit for consumption (think dark chocolate, oats or olive oil). The difference lies in the ingredient label for that processed food. When we try to help our clients make the shift from the SAD diet to a healthier, more whole food based diet (with a huge emphasis on plant-based foods), one of the first places we start is by helping with reading food labels and navigating the grocery store. As humans, we’ve been programmed to keep our eyes peeled for certain buzz words or terminologies, especially when it comes to shopping for food. From ‘gluten-free’ to ‘natural’ to ‘sugar free’ to ‘made with whole grains’, companies use the front of the label as a way to market their products (if they didn’t they might not make sales). The question is how to live a healthy, gluten-free lifestyle without compromising on the foods you love? There are a couple of ways we keep it gluten-free, while staying healthy, helping our gut microbes thrive, and still make sure we don’t feel deprived. Since the front of the label is designed to reel you in to buy a product, the best place to look first is the actual ingredient list and nutrition facts box. Make sure you’re looking for those terms that can indicate a highly processed food, such as: modified starches, vegetable oils such as soy, corn and canola, corn syrups, artificial sweeteners and maltodextrin to name a few. In addition, look for artificial colours, preservatives and shelf stabilizers. Sugar: aim for less than 8 grams of sugar per serving for breakfast and sweet treats such as cookies, granola and cereals. Salt: If it’s a main meal, aim for 600mg or less, and for snacks aim for 300mg or less per serving. Quick overview of the rest of the label: does the label have a balanced ratio of protein, carbs and fat? Prebiotics are indigestible starches that help feed your healthy gut bacteria. On the other hand, sugar in excess feeds your unhealthy gut bacteria such as candida or yeast strains. Make sure you reach for foods that contain prebiotics, and even fermented foods that contain probiotics in order to keep your gut feeling healthy. You can download a list of the Top 25 Gut Healing Foods that are rich in probiotics and prebiotics here. There are so many products out there are gluten-free and contain whole grains, but you would hardly know that you’re eating whole grains. Take GoGo Quinoa for example, many of their pastas taste quite similar to ‘white flour’ pasta but they contain whole grains like sourghum or quinoa. 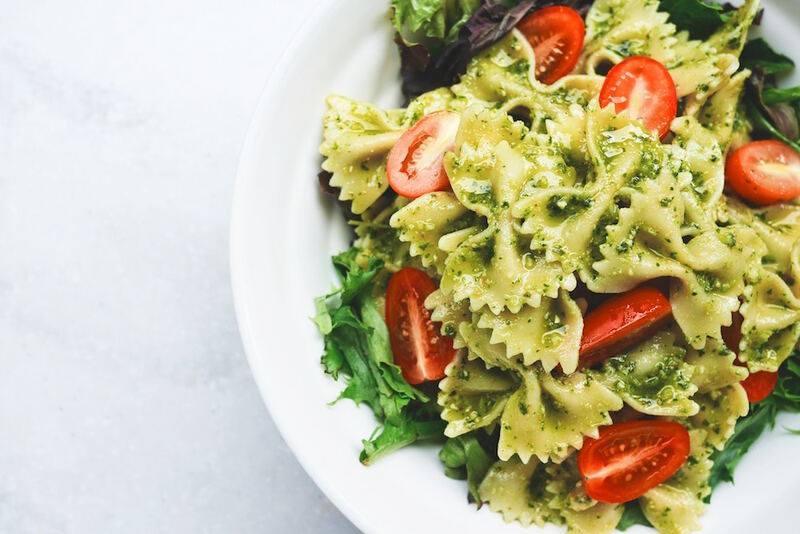 These grains not only contain beneficial nutrients like your B vitamins, protein and fiber, but they can be made to taste really amazing, such as in this Gluten-Free Pesto Pasta With Roasted Veggies. 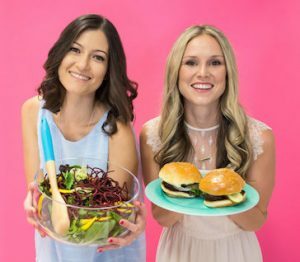 Next, you’ll find some our favourite products to incorporate into a gluten-free lifestyle without the worry. Super Grains Fusilli: made with organic sorghum, quinoa, amaranth and chia flours, 1 serving of this pasta provides you with 16% of your daily fiber and iron requirements and is an absolutely delicious alternative to your pasta dishes whether you are gluten-free or not. Double Chocolate Quinoa Cookies: these yummy cookies are a staple in our cupboards when we want to have a quick sweet treat or dessert. They also contain kaniwa flour, and if that’s the first time you hear of it, kaniwa is actually pretty similar to quinoa, slightly smaller in size and little sweeter. Sprouted Brown Rice Crisps Cereal: This gluten-free cereal by One Degree Organic Foods is not only sprouted, organic and gluten-free but also tested for glyphosate and contains only 1 gram of added sugar (from coconut) per serving. Kale Chips: are one of the healthiest mindless munchies that you can pick up to snack on with flavours such as Kool Ranch, Honey Mustard and Mango Habanero, being gluten-free doesn’t mean a lack of flavour. 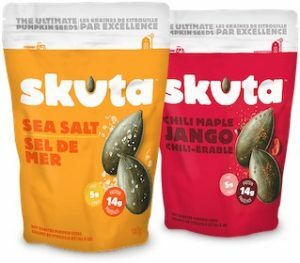 Skuta Pumpkin Seeds: You haven’t tried pumpkin seeds until you’ve got your hands on Skuta. 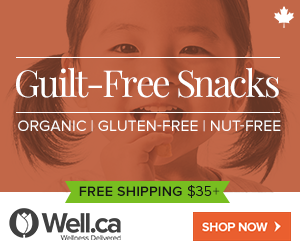 Naturally gluten-free these protein-rich and flavour packed seeds will be your new go to gluten-free snack. 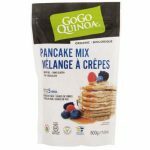 Pancake Mix: Made with only 5 ingredients, we love this ready pancake mix that can be used to make pancakes, crepes or even waffles. A healthy diet that is sustainable is one that allows you to find balance with healthy, whole foods and pure pleasure foods. 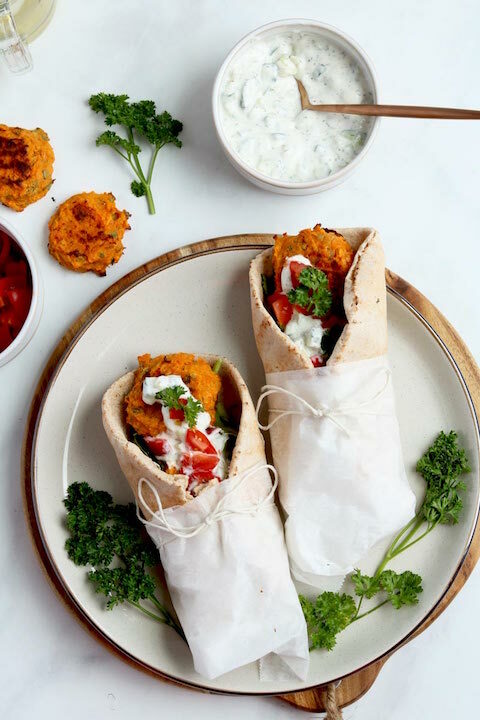 Opt-for a diet that is high in fruits and veggies, whole grains such as buckwheat, quinoa, brown rice, amaranth, sorghum and other gluten-free whole grains, and healthy sourced protein (whether it’s from an omnivore source or a plant-based source). These foods will help you thrive and help your gut and immune system thrive as well. But living completely void of treats can be really tough, so find your balance. We like to aim for 80% nutritious 20% freedom. That way when you reach for a gluten-free processed cupcake, you also know that you’ve had healthy whole foods in your day as well. We like to live life by not letting food or food restrictions define us. Remember, you went gluten-free to feel better, not worse. So, taking your health into your hands by being gluten-free is a great first step, but it doesn’t have to be a negative thing, or something that defines who you are or how you live. Living gluten-free can actually be a great thing. You can experiment with gluten-free baking, gluten-free cooking and use it as a tool to make your quality of life way better! Gluten-free living also doesn’t have to be limiting. Amazing brands are out there and various lines of wonderful products, it just goes back to the first point about reading labels and understanding what’s going into your food in the first place. Living gluten-free is also the first step to healing your gut, so whether you are celiac, have digestive disorders, are looking to reduce your inflammation or have a sensitivity, gluten-free living can be a great first step in helping you heal your gut. 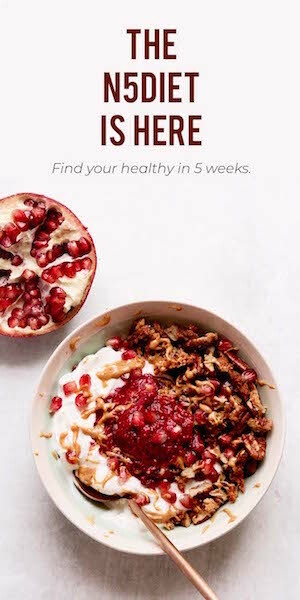 If you’d like to learn more about our healthy living plans, make sure you check out the N5Diet, a 5-week health plan that focuses on simplifying your health with realistic and easy to apply tips, as well as over 125+ recipes (over 95% GF) all made with 5 ingredients or less.